ALTON — Long-time Alton resident Sylvia Roberts died peacefully at her home in Virginia on Sept. 22, 2018 after a brief illness. Mrs. Roberts was born on Dec. 6, 1919 in Willis, Kansas, the daughter of John and Abbie (Watkins) Howard. In 1941 she married Francis Kaar of St. Paul, Minnesota. They moved to Alton in 1955, where he died in 1967. In 1970 she married Bill Roberts, who died in 2005. Mrs. Roberts was a registered nurse, graduating from the Cook County School of Nursing in 1942. During World War II she worked as Head Nurse at the Washington Quartermaster Depot in Alexandria, Virginia, and then returned to Cook County Hospital as head nurse in the Premature Baby Department. Community affairs were very important to Mrs. Roberts. 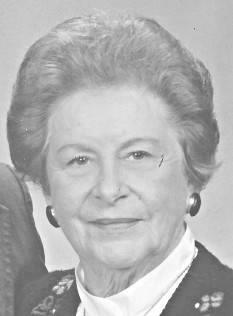 She was a member and past president of the Alton Community Service League and PEO Sisterhood; she served on the Foundation Board and the White Cross Auxiliary of Alton Memorial Hospital, and was a past board member of the Easter Seal Society, YWCA, and the Olin Vocational School of Practical Nursing. She was a long-time member of First Presbyterian Church of Alton, and for recreation she enjoyed golf, bridge, and traveling, which she and Mr. Roberts did extensively. Surviving are a daughter, Susan Kaar Trainor and her husband Bob; a stepdaughter, Susan Roberts; a stepson David Roberts; and three grandchildren – Sarah Trainor, Kathryn (KT) Roberts, and Jennifer Roberts. Funeral services were held at First Presbyterian Church, 4th and Alby, Alton, on Oct. 17 at 11 a.m. In lieu of flowers, memorials may be made to First Presbyterian Church in Alton or to one's favorite charity.